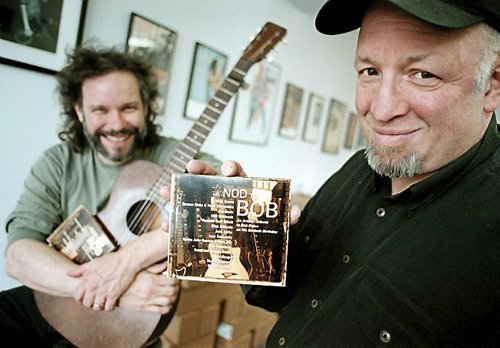 On this photo from April 10, 2001: Red House Records President Bob Feldman displays a CD tribute as musician John Gorka, left, looks on at the Red House Records offices in St. Paul, Minn. Red House Records has been sold to Compass Records Group of Nashville. The sale was announced Tuesday. (Dawn Villella, File/Associated Press) . One of the longest-running and most widely known record labels in the Twin Cities, roots/folk imprint Red House Records has been sold to a kindred Nashville company and will shut down its offices in St. Paul. The Grammy-winning independent outlet, founded in 1983 by the late Bob Feldman, has been bought up by Compass Records Group, an eclectic company that counts the Proclaimers, Colin Hay, Bobby Long, A.J. Croce and Shannon McNally among its stable of acts. It's not clear what will happen to the employees who work for Red House, but a statement said the Minnesota musicians affiliated with the label will stay on under the Red House banner as part of the Compass roster, including John Gorka, the Cactus Blossoms, Charlie Parr, the Pines and Chastity Brown. The founders of Compass, producer Garry West and musician Alison Brown, were mentored by Feldman when they started up their label in 1996. Their friendship with the Red House guru apparently eased the hard conclusion made by his widow, Beth Friend, who has kept the label going with help from some dedicated staffers after her husband's death in 2006. "This was a very personal and very difficult decision for me to make," Friend said in a statement, declining interview requests. "It's simply time for me to bring this chapter of my life to a close and move on." While vinyl sales have been a modest boon to some independent record labels, Red House relied more on CD sales, which are in decline, and streaming and downloading services, which notoriously pay a lot less to labels and artists than the recording industry models of old. "The harsh reality of it is there's a lot of consolidation going on in this business right now," said Compass co-founder West, who did not sugar-coat the likelihood of layoffs among the half-dozen or so St. Paul employees but nonetheless pledged to "maintain the legacy that Bob created." "We are very mindful of Red House being a St. Paul/Minneapolis-centric operation, and we will do our best to integrate its own unique identity into our business operations here," West added. One of the company's best-known artists, Gorka, told Billboard magazine he believes Red House "will continue to be a great label." "I understand the economics, and I think Compass is the best place to go," said the veteran folk tunesmith, who has a new album due for release next year. "Compass has a lot of artists I admire and respect, and I think Red House will be in good company." Gorka is one of the longest-tenured artists at Red House, which started out with Iowa folk hero Greg Brown as its flagship artist and grew to include the likes of Lucy Kaplansky, the Wailin' Jennys, Loudon Wainwright III, husband/wife duo Larry Campbell and Teresa Williams and a lot more acts frequently heard for decades on its hometown radio show "A Prairie Home Companion." The 1995 album "South Coast" by Ramblin' Jack Elliott won the label a Grammy Award for best traditional folk album. 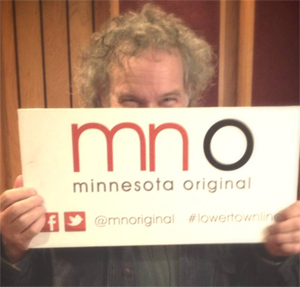 From start to finish, Red House remained a great resource for Twin Cities musicians, lending a home to Bob Dylan's old cronies Spider John Koerner, Dave Ray, Tony Glover and Willie Murphy along with such virtuosic acoustic acts as Peter Ostroushko and Dean Magraw. In recent years, the label fostered the currently budding careers of younger newcomers the Cactus Blossoms, the Pines, Chastity Brown and Actual Wolf. "Red House has been so good to me," said Parr, who just dropped his latest Red House album, "Dog," in September. "I've felt extremely supported and grateful for the opportunity to work with them. It was really nice having a local record label with such an amazing reputation.
" While that local connection will likely dwindle, Friend still sounded optimistic of the label's future. "I know [Compass] will bring a level of care to the Red House imprint that I don't believe I could have found in another buyer," she said. Hoping to gain ground in the roots-music marketplace, Compass Records Group is acquiring Red House Records, the label group tells Billboard. Nashville-based Compass Records has built a name for itself in recent years through its eclectic roster of talent, ranging from Colin Hay (Men at Work) to bluegrass luminary Bobby Osbourne. Red House, meanwhile, became synonymous with folk and Americana music with a steady stream of iconic releases during its 34 year history. In recent years it has been best known for helping launch Larry Campbell and Teresa Williams' careers as a duo , as well as fostering the next generation of roots talent in The Wailin' Jennys and The Cactus Blossoms. Founded in 1994 by musician Alison Brown and producer Garry West, Compass sought the advice and guidance of Red House’s late Bob Feldman as the label became larger over time. First meeting at a conference in 1995, the trio found friendship and sounding boards amongst each other. "Bob was always the most straightforward and would tell it like it was,” says West. “I have to admit it gave me a great feeling of accomplishment when, over time, Bob started calling me to compare notes." "It's incredibly meaningful for us to be able to carry Red House's legacy into the future," says Brown. "We are really excited to work with such a fine roster of artists and are committed to keeping Red House's brand of folk and Americana music alive." The sale comes on the heels of Feldman's death in 2006, which saw his widow Beth Friend take over operations of the label in his stead. Current plans call for Red House Records to be completely integrated into Compass Records Group's offices in Nashville, but at press time there was still no word on which Red House employees (if any) would be joining the Compass team. Established in 1983, Red House has received indie music awards, numerous GRAMMY nominations and a GRAMMY award for Ramblin’ Jack Elliot’s album, South Coast, in 1995. Compass Records has over 600 titles in its catalog. Compass’ latest signings include NYC indie darling Elizabeth Ziman (Elizabeth and the Catapult) and rising bluegrass/Americana star Molly Tuttle. The Compass Records Group is also home to two seminal Irish catalogs, Green Linnet and Mulligan Records, both acquired in the mid-2000s. St. Paul folk label Red House Records has been sold to the Nashville-based Compass Records Group. Billboard reported the acquisition Tuesday, with plans calling for the label to be completely integrated into Compass’ Nashville operations. There was no word late Tuesday which, if any, Red House employees would move with the label. Red House’s office on West Lynnhurst Avenue will close its doors. In a statement, Red House CEO and president Beth Friend said: “This was a very personal and very difficult decision for me to make. It’s simply time for me to bring this chapter of my life to a close and move on." Brown eventually agreed and Feldman turned Red House into one of the country’s leading folk music labels. After Feldman’s unexpected death in January 2006, his longtime colleague Eric Peltoniemi stepped in to continue the tradition. Peltoniemi retired last year, leaving leadership in the hands of Friend, the label’s owner and Feldman’s widow. John Gorka, Robin and Linda Williams, Eliza Gilkyson and Lucy Kaplansky are among the many acts that have released albums on Red House Records. More recently, the label has signed regional musicians like Chastity Brown, Actual Wolf, the Cactus Blossoms and Charlie Parr. The Compass Records Group has more than 600 titles in its catalog with a focus on folk, bluegrass, Celtic music, jazz and new acoustic artists. 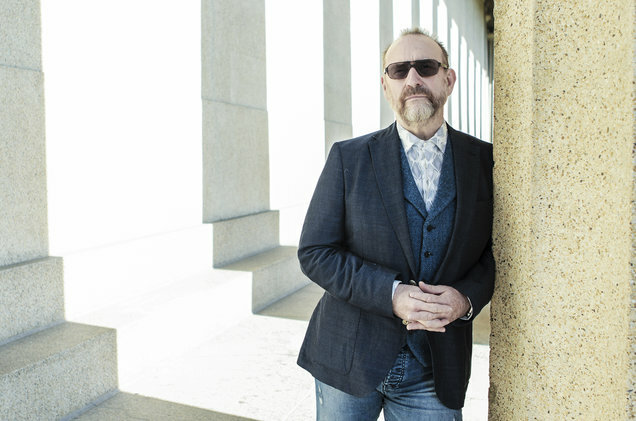 Men at Work’s Colin Hay, the Proclaimers, the Infamous Stringdusters, Bobby Osborne and Claire Lynch are among the company’s current artists. Compass is also home to two seminal Irish catalogs, Green Linnet and Mulligan Records, both acquired in the mid-2000s. Ross Raihala A Minnesota native, Ross Raihala joined the Pioneer Press as pop music critic in 2004, after stints at The Forum in Fargo, N.D., and The Olympian in Olympia, Wash. He covers local and national music as well as some theater and other arts and entertainment topics. His favorite part of his job is reviewing, and live tweeting, Twin Cities arena concerts. And, yes, he saw the same show you did. Click here for the Red House Records news on the Compass Records website.